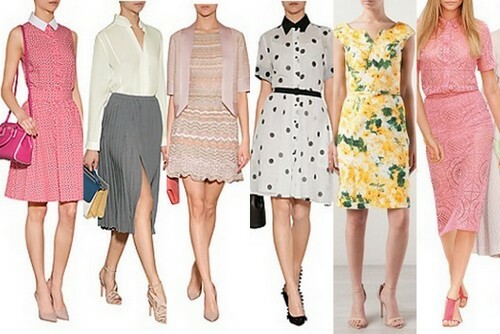 The designer Spring & Summer fashion runways for this season continue the trend of a lot of variety in silhouettes, styles, colors, and patterns. Great for putting together looks that work for you and your lifestyle. 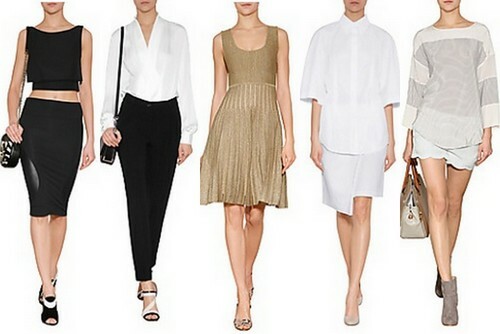 The main trends are still in the direction larger silhouettes and longer lengths. Although crop tops, including boxy shapes and sports-bra styles, are in more of the collections. Many garments have relaxed fits inspired by sportswear. Tribal, folk and bohemian looks inspired by cultures around the world. 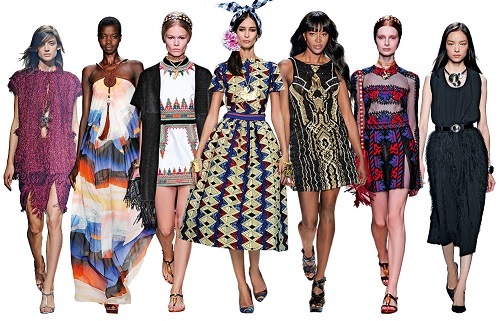 I'm particularly noticing American Indian (for example, embroidery patterns and fringing) and African tribe influences (for example, the Diane von Furstenberg floaty chiffon dress, second from the left above). Larger silhouettes include boxy 60s Mod style, Japanese-inspired shapes, and more fluid overblown shapes. Tops are getting shorter again -- if you want to try this style and your waist and mid-riff are in reasonable condition, but you're not young enough to want to expose skin in that area, choose high waisted bottoms and/or layer a cropped, boxy top with a camisole underneath in a similar colour tone. Sports-luxe garments in shapes and fabrics usually associated with sports or active wear, translated to everyday and even evening wear (in more luxurious fabrics). 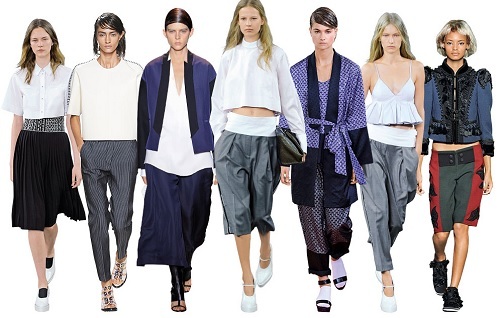 Dressing up harem-style track pants with heels and a dressy top, for instance. The greater variety in skirts styles is continuing. Both in choice of shapes and lengths. There are more midi lengths around (anywhere from just under the knee to below mid calf) and a few long length skirts too. Pant legs are slowly getting wider and the fit more relaxed, although there are still a lot of skinny and very slim styles around. There are also many cropped styles around, including Audrey Hepburn style cropped, slim straight styles and relaxed fit, tapered, rolled hem boyfriend jean styles. 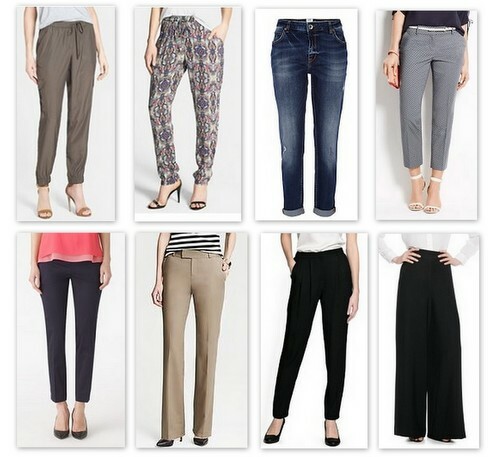 (I'm trying to ignore the wide-legged cropped styles and you should too unless you're very tall and slim!). However, cropped pants can be a great alternative to shorts if you no longer want to expose your legs to public viewing! Jackets include biker and bomber styles in leather, faux leather, fabric, knit, or a mix of leather and knit. Watch for bomber styles in printed fabrics. Denim jackets are also very on trend. Sheen and shine in metallics used for pants, skirts, dresses, shirts, shoes, bags and jewellery. The trend of wearing clashing prints together continues and is now also appearing within a print -- a colorful floral print appearing as accents on a black and white print, for instance. Painter inspired -- both artist and decorator-splash styles! I like to start by looking at Style.com. 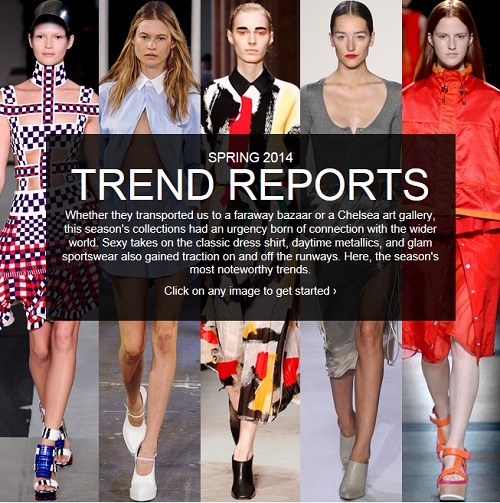 The site provides it's own trend summary for the season. It also has a good selection of videos of the designer runway shows, both couture and ready-to-wear. I then look at the Instyle.com for their interpretation. Next I'll look at some of the major department stores such as Nordstrom, in the US, and John Lewis, in the UK. I look for their trend summary and their look books. Then I check what's actually available to buy by looking at the 'new in' section of a range of stores online. Which of the runway trends are making in onto the high street? Sometimes a trend is picked up immediately, other times it takes a while to filter in, and some trends never are taken up. I like to use the trend forecasts to identify new silhouettes and lengths to try, and especially for ideas for styling outfits. The aim is take the ideas that appeal to you and blend them into your look, never lose sight of what suits you, but do have some fun with your clothes! Need Help Creating Your Look? If you need help identifying your personal style, or would like help putting outfits together contact me for a style consultation.